Man oh man do I love scones. They’re like having a cookie and a slice of freshly baked bread for breakfast all in one. My favorite part about scones is when you break them open immediately post-oven, almost burning your fingers, to discover the perfect nooks and crannies upon which to lather butter, jelly, or honey. They take no time at all to make, and they’re pretty hard to screw up. Everyone should have a basic scone recipe on hand, for those days when oatmeal just won’t do. Or for when you discover four of your friends crashed in your house the night before. Once you have a good recipe, you can throw whatever you want at scones and they’ll deal with it perfectly. If you’re feeling blueberry, cool. If you have one mango left that’s kinda looking a little overripe, no problem. If you recently discovered some bags of candy at your friends house, why not?! 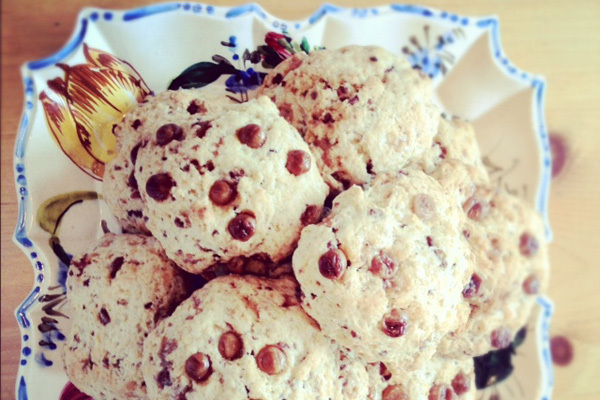 I share this scone recipe with you because it is the perfect base recipe. The heavy whipping cream stands in for the normal combination of milk & butter. It makes these scones perfectly flaky, but also very rich and filling. You’ve been warned! I had never thought to put candy into scones, but combined with walnuts it makes for a great crunch. To make these scones in a variety of different ways, just substitute 1 to 2 cups of your favorite something for the candy and nuts. Preheat oven to 375˚F. Butter or spray two baking sheets. In a mixing bowl, combine flour, sugar, baking powder, and salt. Mix until fully combined. Add candy pieces, nuts and whipping cream. Mix with a spoon until the batter is combined (no pockets of flour or wetness) and then knead with your hands for two minutes. You can knead the dough on a lightly floured surface, or just do it in the mixing bowl (be sure to coat your hands with flour). Once dough has formed, form generously sized circles of dough with your hands and put them on the baking sheets. They should be about the size of two cookies, approx. 2 inches thick and 3.5 inches across. If you want, sprinkle with a light amount of cane sugar, but these are generally sweet enough. Bake for approx. 20 minutes, or until the tops have lightly browned. Serve immediately with your favorite side. Burnt fingers allowed. Kenzie Zimmer lives, eats, writes, bikes, drinks, blogs, and has occasional moments of twenty-something induced anxiety in Minneapolis.